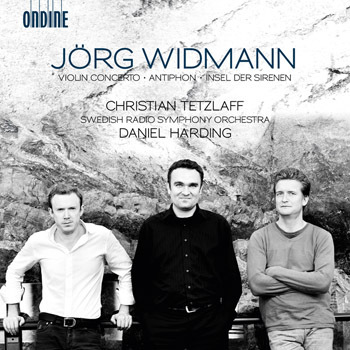 Ondine proudly presents the first CD with works by German composer Jörg Widmann (born 1973) only. This release features his Violin Concerto (2007), Insel der Sirenen for Violin and 19 Strings (1997) and Antiphon for Orchestral Groups (2007-08). The acclaimed violinist Christian Tetzlaff, for whom the Violin Concerto was written, plays the solo part in these works and handles their challenges with incredible perfection. He considers this Violin Concerto to be one of the greatest contemporary concertos. Daniel Harding, one of the brightest conductors of the younger generation, is a frequent visitor for the top orchestras worldwide. In his position as Music Director of the Swedish Radio Symphony Orchestra he has developed the orchestra to become one of the most interesting and diverse ensembles. The Swedish Radio Symphony Orchestra, one of Europe's foremost orchestras, collaborates continuously with leading conductors, soloists and composers. Their strong commitment to contemporary music is also reflected on the present recording.